Research and studies conducted around the country have confirmed that younger children are far more susceptible to injury and accidents around the poolside area than any other place at home. These accidents often results in injuries, and in more extreme cases, can even lead to death. As such, it is of vital importance that every aspect of safety is considered by homeowners, both in and around the pool. One of the most essential parts associated with safety around the poolside is the fencing itself. Traditional steel and wood fencing is being slowly being overtaken by Frameless Glass installations around the poolside areas, by more aesthetically concerned homeowners. 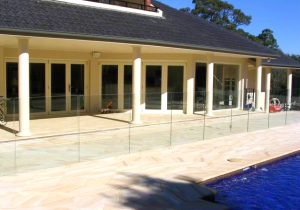 However, few people realise that apart from being much more visually appealing as compared to normal opaque fences, Frameless Glass pool fencing also provides the highest number of safety advantages. First of all, while acting in the very same way a traditional wooden or steel fence would, Glass Pool fencing manages to keep young children from getting into the pool by themselves, without supervision. Furthermore, the absence of gaps or edges with Frameless Glass fencing reduces the risk of the young children getting hurt directly by the fence itself, or getting stuck in gaps in the fence. Frameless Glass Pool Fencing can also be made to order to fit into any size or shape, which means it is customisable to fit and suit any area or home. 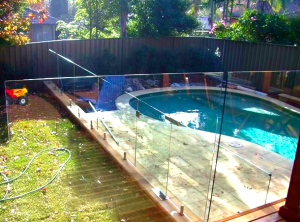 Our Frameless Glass Pool Fencing is made from custom manufactured glass that is approximately 10-12mm thick. This toughened glass is extremely durable and strong, while maintaining its visual excellence. Pool Fencing made of glass is also far easier to maintain compared to wood, iron, metal or chain links. Other non-glass types of fencing can often rust or rot, and promote the breeding of bacteria and pests – which can in turn lead to diseases or the risk of pest infestation spreading. Rusted fences are particularly dangerous as they can also cause infected wounds, should anyone suffer a cut from one of the rusted areas. 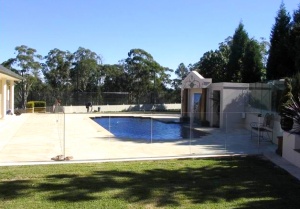 Frameless Glass Pool Fences completely remove this danger, and are very easy to clean and maintain. Furthermore, you won’t have to spend time painting or applying rust and water repellent to the fence, as you would have to if you installed a fence made of wood or metal. 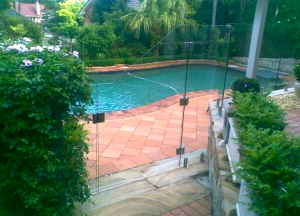 Another often overlooked safety feature of pool fencings made out of glass lies in the property of the glass itself. Glass has the ability to blend in beautifully with the background so it will not look out of place with any decor. Although being transparent and being able to offer an unobstructed view, this feature of glass pool fencing is not only good or visual enhancements. The transparent property of glass also ensures that concerned parents can supervise their children in the pool from anywhere nearby. With Glass Pool Fencing, you do not have an obstructed view from outside the pool area, as you would from wooden or steel fences. Anyone using the pool that gets into difficulty or trouble can easily be spotted and helped by a person nearby. 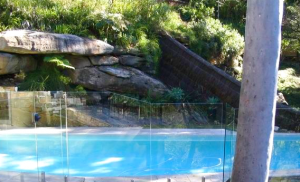 Glass pool fencing is easily the safest and most beautiful pool fencing option around. Should you decide to make glass pool fencing your choice, contact us to arrange a no-obligation quote at your property. Our work is guaranteed and compliant with all safety regulations, and if you choose us, you can be assured that your fencing will be manufactured and installed properly and professionally by our experienced tradespeople. Contact us now for a free quote, or to ask us a question. 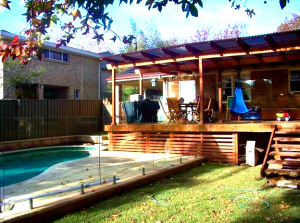 You may also be interested in seeing our Frameless Glass Pool Fencing video. You make a great point about how important it is to make sure you install a fence around your pool to ensure the safety of you and your kids. My toddler is starting to walk, so I want to make sure our pool is completely closed off in case she ever tries to sneak outside. I like how the glass fencing looks since you can barely tell it is there. I also like the idea of being able to see what is going on in the pool without having to be inside the fenced area.